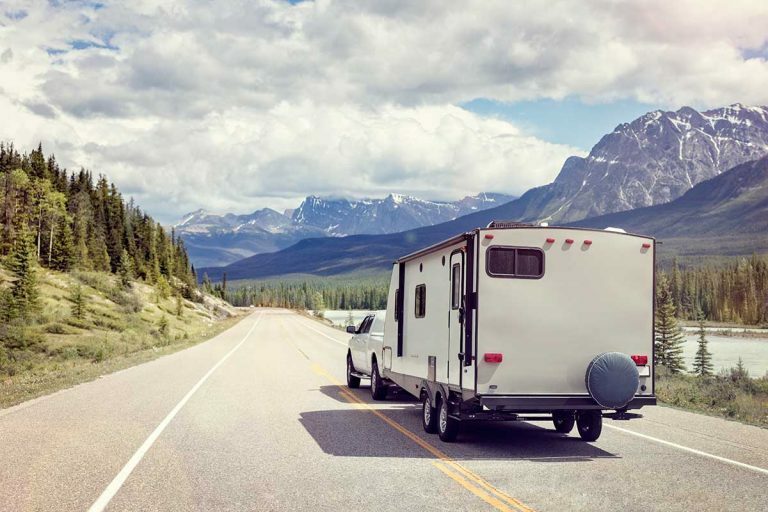 Anyone towing an RV is – or should be – afraid of trailer sway. Trailer sway isn’t only scary – it’s downright dangerous. Fortunately, there is a lot you can do to prevent trailer sway from happening. In fact, I’ve put together a comprehensive list of things you can do to prevent trailer sway. Of course, titles are not enough. 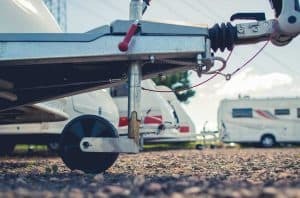 If you’re towing a travel trailer, keep reading because you need to give this enough attention. In this post, we’ll discuss trailer sway and what can cause it to happen. Then we’ll go into each one of the 14 prevention measures and explain how to implement them. Finally, just in case – we’ll also talk about what you need to do should you experience trailer sway after all. What is trailer sway and why is it so dangerous? Trailer sway is a dangerous phenomenon where a trailer rocks side-to-side as you drive. When this happens in cars, it is commonly referred to as fishtailing. Many factors, including excessive speed and high winds, can cause trailer sway. By having a properly setup truck and trailer, though, you can safeguard against it. Because trailer sway is the primary cause of trailer-related accidents, it is very important to do everything you can to prevent it. In this article, we will first describe some risk factors, then we will provide a series of steps to take to reduce your risk. Finally, we will discuss how to react should you experience trailer sway on the road. Let’s first look at a couple of videos that show real-life dashcam footage of trailer sway. A full-sized truck pulling a large travel trailer veers to the left after going under an overpass. After the trailer’s wheels go off the side of the road, the driver swerves to get it back on the road, which causes the trailer to sway back and forth. Luckily for everyone involved, the driver was able to regain control of the vehicle after the sway began. After some minor sways at the beginning, the trailer starts to sway violently across the freeway as the driver struggles to retain control. The trailer quickly ends up tipping over as the tow vehicle swerves across multiple lanes on the road. Fortunately, no one was hurt (according to the video description), but this example shows just how fast trailer sway can turn into a life-threatening situation. Let’s take a moment to figure out what actually causes a trailer to sway while on the road. Understanding the physics behind this dangerous phenomenon is actually imperative to prevent it (or dealing with it should it happen). Improper weight distribution is one of the leading causes of sway. By loading too much weight in the rear of a trailer, the front end gets lighter. Novice trailer owners might find this appealing. After all, your tongue weight is lighter, reducing the weight supported by your vehicle. Taking a moment to actually consider what is happening, however, will show why this is such a bad thing. A light tongue weight means the rear of the trailer is overburdened. When the trailer moves, it can act like a pendulum, swinging back and forth as it pulls your vehicle along with it. Most manufacturers recommend a tongue weight of between 10 and 12 percent of your overall trailer weight. While too little weight is bad, so is too much. A heavy tongue weight can cause your rear vehicle’s rear end to sag while lifting up the front. This reduces your front tires’ traction on the road, giving you less steering control. Properly set up, this model vehicle is able to regain control even when the trailer is violently rocked. Transfer a small weight from the front to the rear, however, and the tow vehicle is unable to overcome the same movement and quickly loses control. Anyone who has ever shopped for a travel trailer knows just how many different designs are out there. It only makes sense, then, that some will be more resistant to sway than others. Poor weight distribution or wheels that are out of alignment are primary causes of sway. This factor is also highly dependent on how the trailer is being used. Even a well-designed trailer can have problems if used improperly or in a way the designers had not anticipated. Exceeding your weight limits is another risk factor to pay attention to. By exceeding your vehicle or trailer weight capacities, not only will your vehicle struggle to pull the weight, but your frame and suspension will also be overstressed. This puts you at risk for many complications, including sway. Any time you are pulling a trailer, it is a good idea to drive slowly. 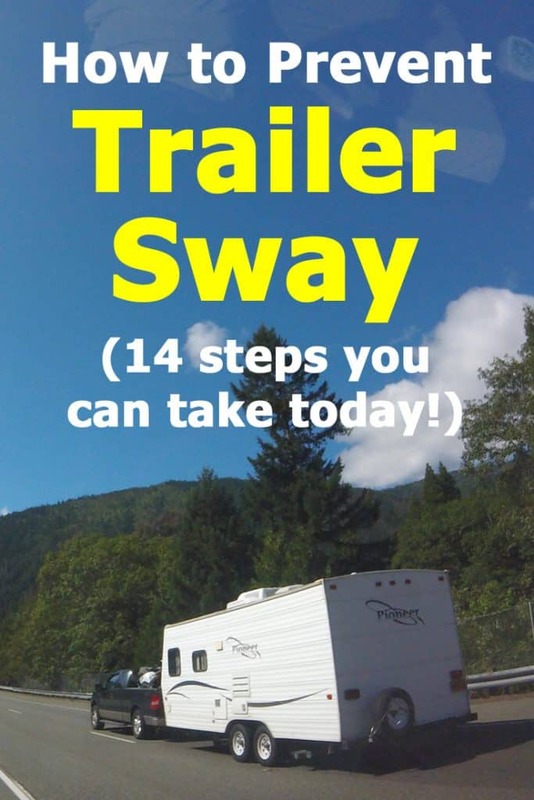 While there are many reasons for this, including the longer stopping distances and excessive wear on your vehicle that are exacerbated by high speeds, trailer sway is one of the primary factors affected by speed. Traveling too fast means your trailer becomes less stable. Should it begin to sway, the effects will be much more pronounced than if the vehicle was traveling at slower speeds. Strong gusts of wind hitting the side of your trailer can cause it to start moving side-to-side. As opposed to a boat or low-profile utility trailer, travel trailers are particularly vulnerable to sidewind because of their high profile. Whether your trailer is able to stand up to high winds, including gusts caused by passing tractor-trailers, depends on your setup. Because it is virtually impossible to avoid high wind situations, every trailer owner must be prepared by having a well-set-up trailer and by knowing what to do if one of these gusts causes your trailer to begin swaying. First and foremost, ensure that your vehicle is rated to tow the amount of weight you need to pull. To do this, you will need to check a few of your vehicle’s capacities. Start with the tow rating: the total amount the vehicle is capable of towing. But that’s not the only number to keep in mind. There is also the GVWR, or the gross vehicle weight rating. This is the total weight your vehicle’s engine and suspension can support: your curb weight, tongue weight, and everything inside your vehicle (yes, including yourself and all of your passengers) must go into this calculation. Next is the GCWR, or the gross combined weight rating. This is the maximum weight of the truck plus trailer that your vehicle can handle. As you can see, there is more to consider than simple tow ratings. Remaining within all of your vehicle’s weight capacities, you ensure that every aspect of your truck can handle the stress towing will put on it. That includes the engine, brakes, suspension, and frame; not exactly the kinds of parts you want wearing out on you. Traction control systems are electronic monitors that help your vehicle regain control whenever traction is lost. When loss of traction occurs, these systems will reduce power sent to the slipping wheels, helping the vehicle remain stable. These systems will not automatically eliminate sway, they are just a useful helper. Choosing a tow vehicle with a longer wheelbase will help your vehicle resist the effects of sway. While a long-wheelbase truck will still feel the sway, the longer distance between the wheels will allow the truck to more effectively counteract the sway motion. A truck with dual rear wheels, or a dually, will provide even more resistance to sway because of their additional traction. Most trucks and medium-to-large SUVs will have an available tow package. Some manufacturers also include such features as stronger brakes, batteries, and alternators. A factory tow package ensures your vehicle is set up correctly. This will prevent breakage due to inadequately installed components, making sway less likely. Obviously, exceeding your tow rating is a recipe for disaster. But some experts advise going even further than that. 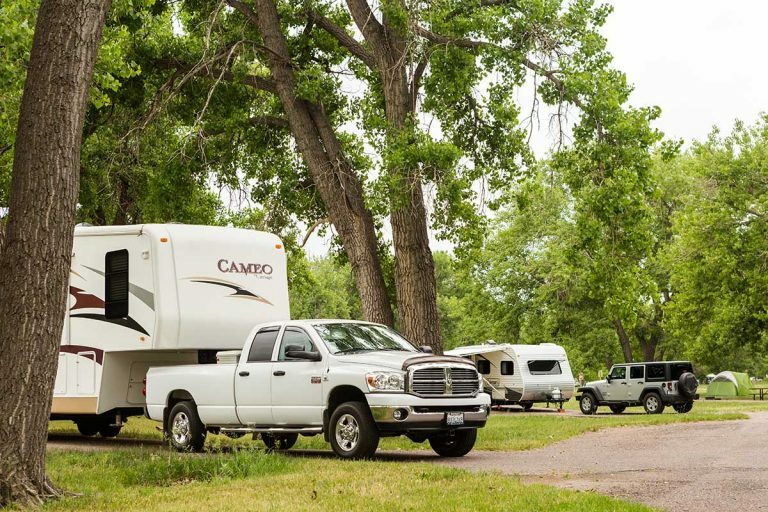 By leaving a 20 or 25% margin under your tow rating, your setup will be that much safer and gives you extra wiggle room in case you miscalculated. Remember all the problems that can be caused by improper weight distribution? Well, there’s a solution for that, as long as you remain within your weight ratings. A weight-distributing hitch uses spring bars and chains to help spread the tongue weight more evenly across all of your axles. These systems can dramatically reduce or eliminate sway caused by high wind. Some even have built-in sway control devices as well. Keep in mind, however, that even with these devices, it is vital to have the proper amount of tongue weight on your trailer. 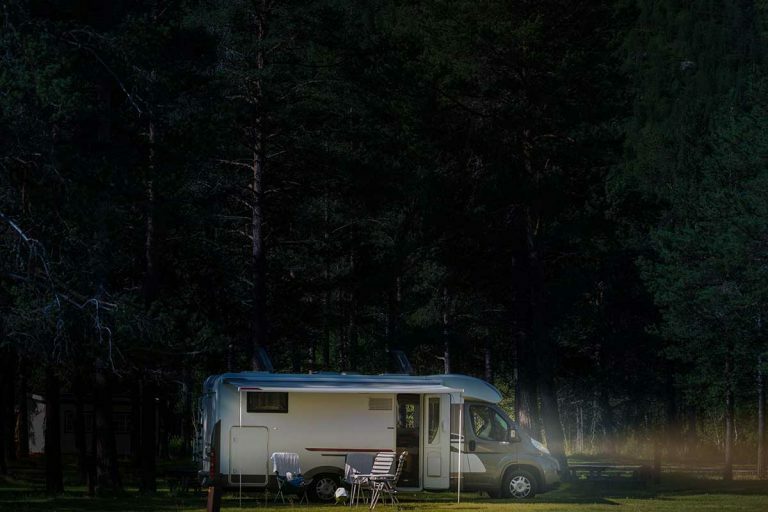 Every travel trailer has a maximum weight rating, just like your vehicle. Exceeding these limits will stress your trailer and lead to many problems, including an increased chance of trailer sway. As you evaluate your rig, there are many factors to consider. For example, if you only look at the unloaded weight of your trailer and forget to add in everything loaded into the trailer, you can easily exceed your rating. Ensure you are towing at a safe weight by paying attention to your vehicle payload and tow ratings as well as your overall trailer weight and tongue weight. About 60% of your trailer’s weight should be at the front of the trailer, closest to your tow vehicle. This is why so many trailers feature stowage located in front of the axle or axles. Measure your trailer’s tongue weight to help you ensure the proper loading technique for your trailer. Aim for anywhere between 10 and 12 percent of your trailer’s weight on the tongue. For some, this can be a hard pill to swallow. 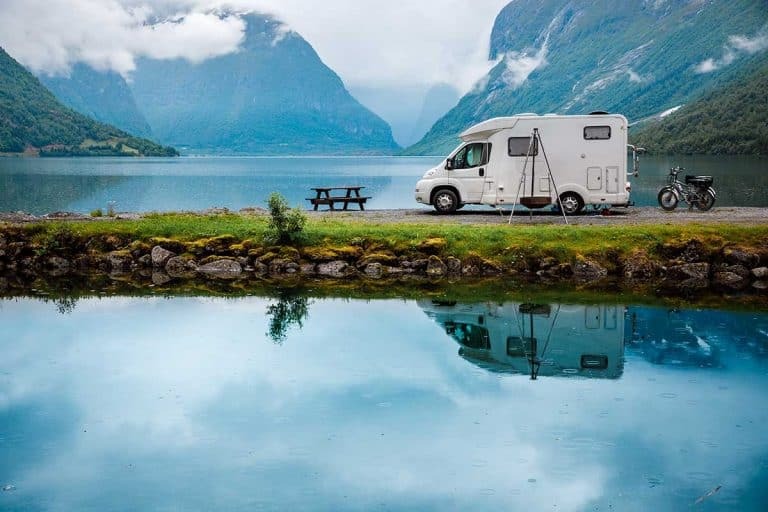 Pulling your trailer is often the least desirable part of your trip, so it is only natural to want to get it over with as quickly as possible. That’s why it is so important to plan on driving slowly. When you are in the moment, competing with traffic and trying to get to your destination on time, it can be easy to forget to maintain a slow, safe speed. With a plan in place to keep your vehicle under a certain target speed, say 55 mph, it will be easier to avoid straying above the listed speed limit. Sudden movements like harsh steering inputs, letting off the throttle abruptly, and slamming on your brakes can all cause your trailer to sway. It is vital to the stability of your trailer that you avoid these abrupt movements that will destabilize your trailer (if at all possible). By giving plenty of space to the vehicle in front of your, driving slowly, and planning your turns and lane changes well in advance, you will give yourself the time and space to drive with calm, measured movements. Always check the weather forecast before setting out with your trailer. Avoiding extremely high winds will always make your travels safer. Of course, it is not always possible to travel only in ideal conditions. Should you find yourself in an area with high winds, gradually reducing your speed is a good idea. If you ever feel that, even at a significantly reduced speed, your trailer is still too unstable, pull over until the conditions improve. If your trailer has an electric braking system, you must have a brake controller in your tow vehicle. Some trucks already have one installed from the factory, while others will require an aftermarket installation. These systems give drivers control over how much force is sent to the trailer brakes when your vehicle brakes are applied, and, importantly, give you manual control over the brakes. We will discuss that in more detail in the recovery section of this article. Knowing the early signs of trailer sway, such as a bouncing or rocking motion, allows you to stop sway in its tracks before it gets out of control. It is always important to carefully monitor your trailer as you drive – know what is going on with your trailer at all times! It is often possible to recover from trailer sway. In fact, professional drivers who are trained to do so, often successfully recover from trailer sway. Keep reading as we discuss the steps to take in a sway situation but remember – since you are not a professional driver with years of experience in towing, prevention is much better than the cure in your case. Let’s look a closer look at each one of these items. Panicking will only make the situation worse. Knowing the next steps to take will help you keep your composure, so memorize them before you get on the road with your trailer. Remember: sudden movements are your enemy. By stomping on the brakes, you are sending sudden movements back to the trailer, which could cause it to careen even more wildly out of control. Instead of using the brakes, simply remove your foot from the gas pedal to slow down. This will keep your rig stable while gradually slowing to a safe speed. Brake controllers give drivers manual brake inputs. That means, if you have one installed, you can apply the trailer brakes by pressing buttons or switches on the controller. Slowing the wheels on the trailer will help slow down your whole rig without the disrupting effect of using your vehicle brakes. Using the steering wheel to attempt to counter the sway can quickly cause your rig to lose control. Steering inputs will only cause the trailer to sway more, which will exert even more force on your vehicle’s hitch and result in a dangerous fishtailing situation. Always do your best to keep the steering wheel straight as you slow your vehicle. After your trailer becomes stable again, do not speed back up. This will put you at risk for trailer sway again. After all, at this point, you haven’t done anything to fix the problem that was causing the sway. Instead, stay at a very low speed until you find a safe spot to pull off and fix whatever was causing the sway in the first place. Do 5th wheels experience trailer sway? 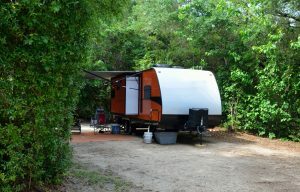 Fifth-wheel trailers are inherently more stable than bumper-pull travel trailers. 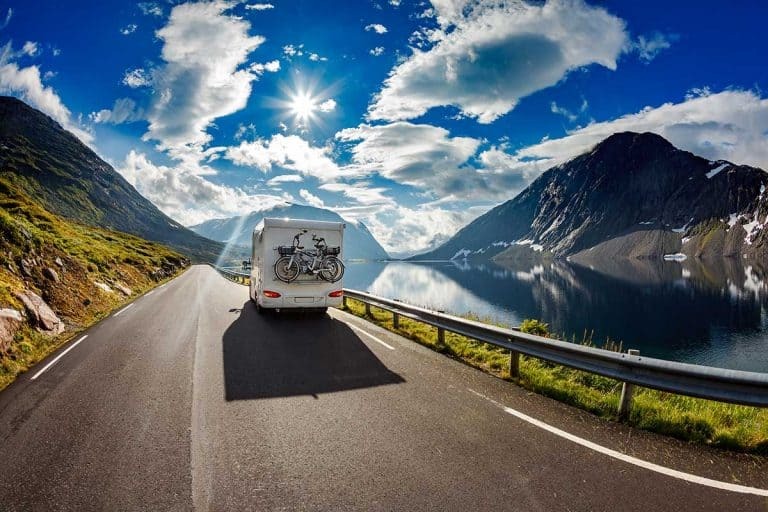 Because their hitch mechanisms are mounted over the wheels and use a more secure mount than a ball hitch, they naturally resist sway in a way that conventional travel trailers cannot. You see, a 5th wheel hitch is mounted in the bed, between the wheels. That means the point where the trailer sway impacts the truck (the hitch) is right where the truck has the most contact with the ground. This makes 5th-wheel setups dramatically more stable than bumper-mounted hitches. That doesn’t mean that a 5th wheel will never sway, just that it is much less likely to occur than in a bumper-bull trailer. If you’re worried about trailer sway, then going with a 5th wheel is a good idea. However, you should still practice safe towing, including slow driving speeds. 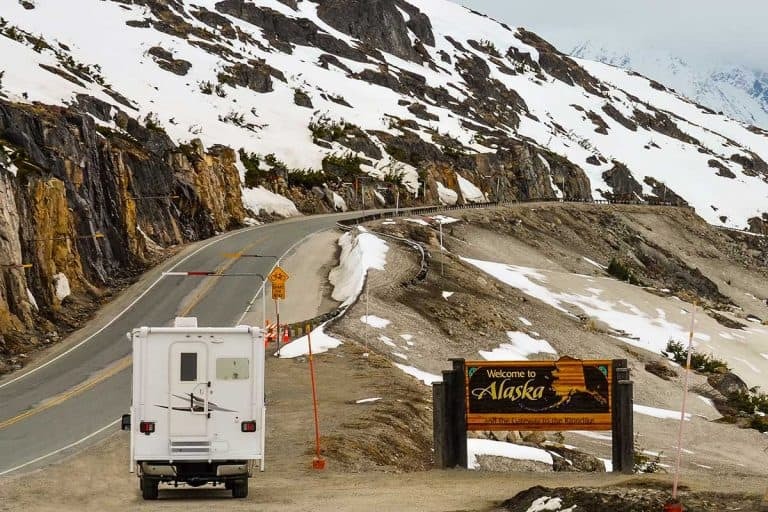 Sorry, there’s just no way of getting around that when towing an RV! Previous PostCan I Park My RV at Walmart Overnight? 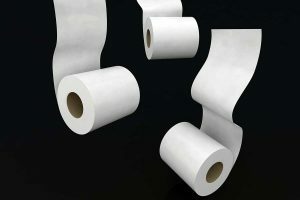 Why Do You Need Special RV Toilet Paper?